I have a dream that all children will be able to learn whatever they want, whenever they want, wherever they want, as fast as they want. I have a dream that children will no longer be forced to learn the same the things at the same time. I have a dream that children will make their own educational choices much sooner in life so they will be less discouraged, learning will be more fun, and they can follow their passion. I bought these domains, because one of my childhood heroes, R. Buckminster Fuller, who invented Synergetics and popularized the geodesic dome, wrote a prophetic book called Education Automation (1962). I became hooked on the idea that we should always know the best way to learn everything we want to learn. Imagine a website where your passion to learn is matched with the best ways to learn about your passion. In the old days, they used to say, learn the Three Rs: “reading, riting, and rithmatic.” It’s true, education needs to start with reading, writing, and arithmetic. These three subjects are the foundation for everything. But we also need to add business. Everyone, all their lives, no matter what they do, will somehow be involved in business. Business skills are needed to run your home, your life, succeed at work, and to change the world. We need Innovation Automation as much as we need Education Automation. All colleges and universities should have undergraduate business schools. When I was in 7th grade, I wanted to learn human anatomy. I would be forced to wait until my 17th grade, my first year of medical school, to actually learn human anatomy. When I was in college, I took a course called medical etymology. That programmed learning workbook was a greatest book I have ever known on learning medical terminology. Where is that book now? What was the name of that book? I have no idea. It's lost to history. But future students should have benefited from that book, because I don't think a better one has ever been written. Why are we losing our best learning resources simply because we can't keep track of them? Why can't we organize education better? We need 24/7 education, after hours schooling, weekend schooling, and homeschooling. We need omnipresent education automation, we need Education Everywhere. We need artificial intelligence to match us to the best learning tools when we are ready learn anything. The databases for all the ratings of the best things are being built, but the information needs to be digested into one place to match each individual's needs. We all need to be connected to the books, games, documentaries, and educational TV shows in a better way than is being done now. We need Education Automation™! What are all the possible treatments? 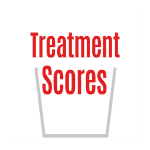 What is the Treatment Score for each treatment?